Arts and Crafts addictions....What a "karupp-did" home we have! 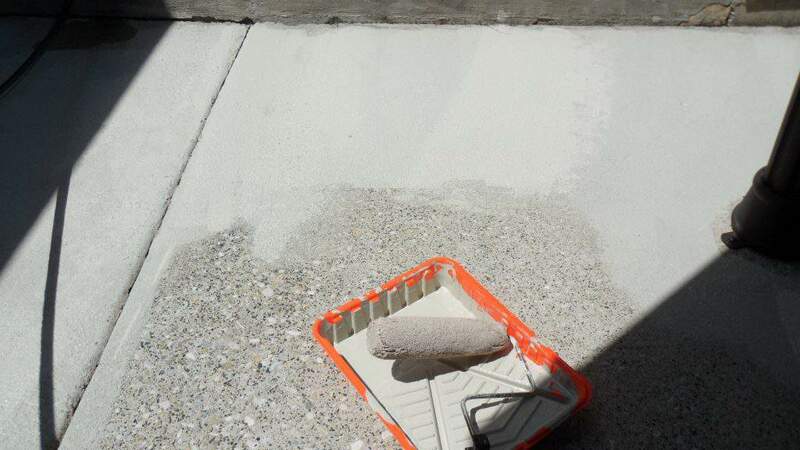 Home » Projects » home reno/DIY » Woohoo….Our painted concrete patio is DONE! 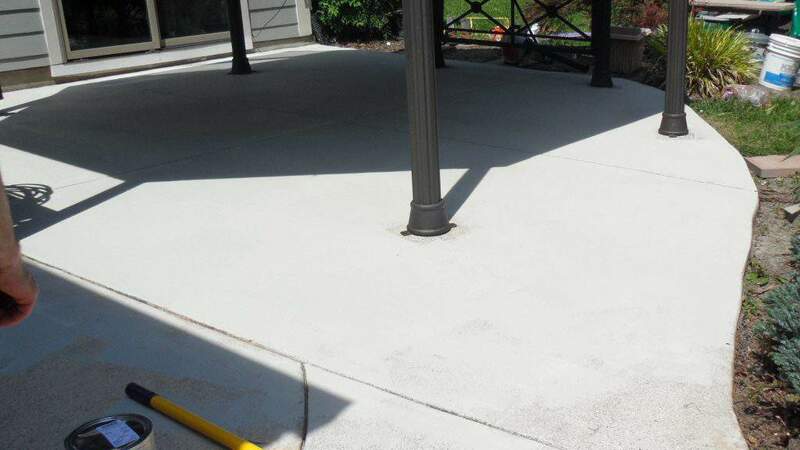 Woohoo….Our painted concrete patio is DONE! We finally finished our Patio Concrete painting project!!!! I am so excited how it looks!! What is more exciting is that it was SOOOO EASY!!!! I really was expecting a project that was a lot harder. This was seriously easier than painting a bedroom. Not only was it easy, the type of paint we used was a breeze to work with. I was quite surprised. We decided to do this when we had a week of sunshine. I think the type of paint says to have 3 days drying time to cure before you can use it. I really don’t think it needed that amount since we painted in 90 degree heat. However, we followed the directions and made sure that we had at least 3 days without rain because we knew we would be applying multiple coats. To prep for this project we POWER-WASHED!! We also attempted to remove oil stains in the concrete. The stains did not completely go away but they were lessened. Out of the 2 products we tried, 1 worked better to remove the oil stains. To see that post and all of the power-washing before and after pics click HERE! We also prepped the area by trimming away any vegetation or bushes hanging over edge of the concrete. Looking for a great CONCRETE PAINT? 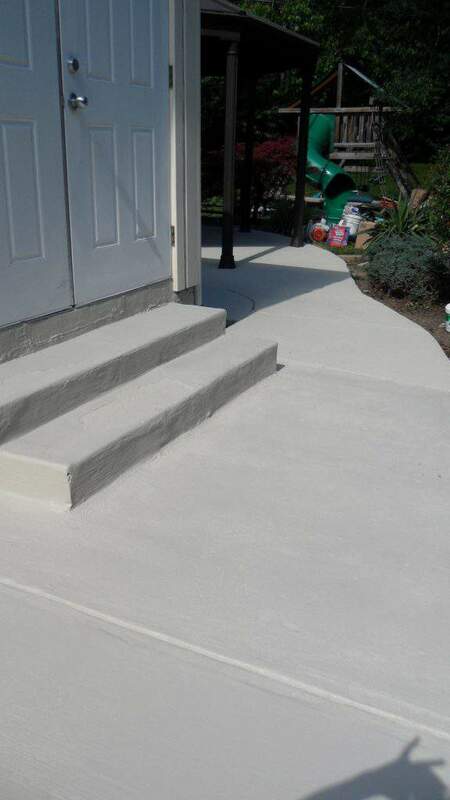 The type of paint is a Sherwin Williams PAINT/STAIN for concrete. We were even able to tint this concrete paint to any color that Sherwin Williams carries. This color was “JOGGING PATH”. We used 6 (1 gallon) cans which were perfect for our ~700 sq. ft. of patio. Normally $44/can, we were able to get it at a discount sale price. We spent $168 for 6 cans of paint!! Yes, rolling the paint on the ground level is so much easier than when your arms are above your head. The 3 of us were painting……Ed, myself and my 12 yr. old. We were able to do 2 coats in 1 afternoon. We waited a little more than an hour or 2 between coats. Because it was so hot we could even walk on it to re-apply. In the directions it said to wait 24 hours before walking on it, but because of the heat and quicker drying time, it seemed fine to walk on it to re-apply the paint. I didn’t let our kids play on it, but for painting the second coat we did walk over the area. We let it dry overnight and the next day we cut in around the gazebo pillars. We used the large paintbrush to cut in and also painted the concrete at the base of the siding. We also rolled the 3rd coat on the patio. At the time we were having trouble seeing that the patio needed a 3rd coat, but after we applied it we realized how much better it looked. It’s DONE and I love my concrete patio now! We are still sprucing up the gazebo and patio little by little. I will be posting new ideas… Come back for more! Want to Save it?………Pin this pic! AND YAY! It was FEATURED HERE! Find the button on my FEATURED page. Author of blog 'Everything Karupped'. Arts and Crafts addictions in our "Karupp-did" home. Don’t miss a post!! We will send you the latest! What does signing up with my email REALLY mean? UGH!! That looks amazing!! Beautiful work, I would have never thought to paint concrete, but I guess anything can be painted, right?! I know!!! Yes, I think anything can be painted:) ha. I really want to use this paint on something else for the outdoors…a new project to think about! Looks fantastic!! We have to paint our small patio block but it seems we have showers predicted for every day…. Thanks so much! YES!!!! I love it! Was it really easy?? Did you put acid on the cement first to clean? I’m worried about my flower beds.Great Job!!! Oh thanks so much!! It was seriously SOO easy! No, we did not need to use acid at all. Our prep: We just power-washed a few days before, tried to remove some oil stains, cut back the foliage, used a blower to blow off anything from the concrete. After the prep, we started painting. Since we used rollers, my flower beds were not affected at all:) I found it easier than painting inside the house. Nice work! The beauty of a clean slate…I will keep checking in to see what’s next. Your patio turned out amazing! It looks so clean and fresh. Great job! Oh thank you so much! It was a fun project! Thanks for stopping by! I am definitely pinning this – thanks! I don’t have a patio that needs painting but I’ve been toying with painting our front porch. I just never know where to start or what to use. Thanks for the great tips. It looks really great and so worth the time you invested to do it. Now you’ll be able to enjoy your patio to the fullest. I wonder if it is hot to walk on barefoot. Our patio is in full sun and now it is too hot to walk on!!! I’m hoping this paint is sort of a “cool deck” paint! Yours looks great, by the way!!! Thank you so much Lyn!! It’s not too hot to walk barefoot. I actually do it all the time. I know that does happen when you go darker with the color because I have felt that on concrete before. I would say the lighter the color- less hot but can get more dirty. Hmmm…I guess it depends what is more important to the homeowner. :). Thanks so much for stopping by and commenting. Thank you so much Marilyn!!! I’m glad you stopped by! I wish I had your computer talents:) hehe. Great job. My porch concrete is really ruff. “Keeps it from being slippery “ says the contractor. It’s a screened in porch, we don’t have a pool and live in Florida. Just exactly when will it be slippery? Anyways the paint you used would that smooth out the “brushed” texture on my porch? Hi Charlotte, HAHA…too funny. ‘Yeah, I did it like that on purpose!’ ha! To answer your question, I would say slightly this paint might help with smoothing the rough textures but not a whole lot unless you put at least 4/5 coats on it. We did 3 and it still feels rough to your feet. Although it is rough, it would look pretty on a screened in porch floor and a lot less work than adding tile. But there might be other options like bringing in a contractor to grind down the roughness and polishing it which would result in something more like a Home Depot floor. Then you could use the concrete paint if you wanted to. For less cost and smoothness though, you might want to consider an epoxy like what they put on a garage concrete floor. I know they have different colors and you don’t have to add the flecks which gives the garage floor its signature look. These are only a couple of options and then there is always tiling it to make it smoother. I hope I answered your question. Good luck! Re-upholster it WHITE and keep the kids too!